Muslims of Igbo extraction have expressed disaffection against the delay in the appointment of an Igbo Imam for the National Mosque Abuja, as promised by the Sultan of Sokoto and the President General of the Nigerian Supreme Council for Islamic Affairs (NSCIA), Alhaji Muhammadu Abubakar Sa’ad III when the Murshid of the Mosque was appointed. According to the group, The Sultan made the promise to erase any tribal attachment on the Imamship of the national institution, considering the fact that the three Imams under the Murshid are two Hausas and a Yoruba. 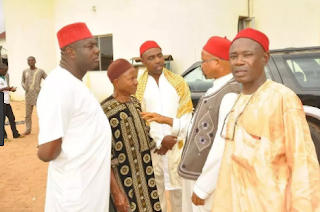 Speaking under a non-government organization, Igbo Muslim Forum (IMF), the Southeast Muslim faithful explained that when the promise was made, the Igbo Muslims were happy to be carried along by the Sultan in that regard. But it has been too long when the promise was supposed to have been fulfilled. ISI Hijab controversy: MSSN talks tough In a statement signed by the coordinator general and secretary of the forum, Suleman A. Afikpo and Dr. Muhammad Amaechi, respectively, they recalled recent convention convened in Abuja by the South East Muslims of Nigeria (SEMON) where some members of the Igbo Muslim Ummah expressed displeasure over the promise described by some as normal lip service. They said that the matter had become a subject of discussion at every forum of the organisation. “The acquiescence of the President General of NSCIA, echoed further by his Secretary General, published in all the major Nigerian dailies after their meeting of the 6th Extended General Purpose Committee in October 9, 2017, was one pronouncement that placed smile on the faces of every Igbo Muslim. “In readiness, we converged in a general meeting that screened and produced three eligible scholars from amongst us for the duty.